I was rummaging through my images the other day, and came across some pictures of guiding on Mt. 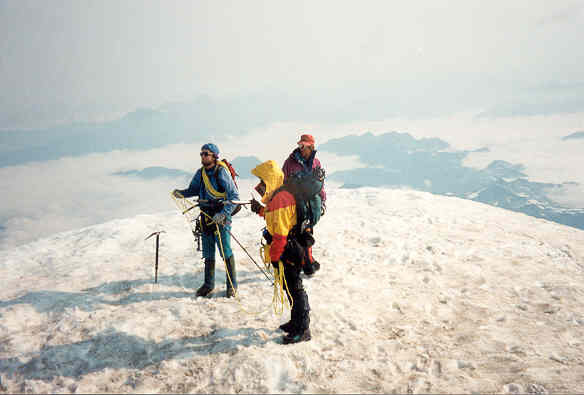 Baker and teaching mountaineering instructors on Mt. Hood. What’s the difference between guiding and experiential education in the mountains? The main difference to me is, experiential ed encourages, or shows people a way to better walk their talk. It allows them space to try new things, physically, mentally an spiritually, in a new environment. The mountains, and a group of people climbing them, can provide a vehicle for huge growth. 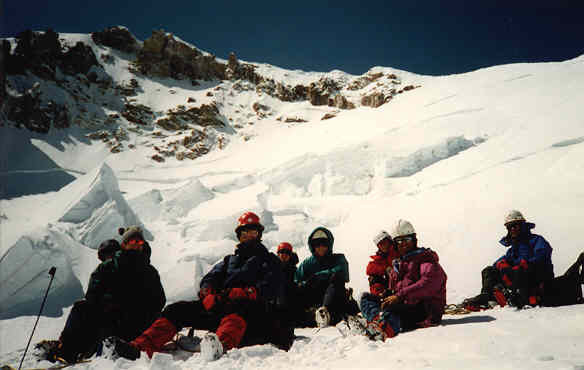 Guiding on Aconcagua, Argentina, and in other areas of South America, I noticed that groups and individuals , whether facilitated or not, go through huge experiences while at high altitude. If the organization has processes in place that allow growth within the group, both positive and challenging experiences can happen. It’s not guaranteed it will happen but may happen. It’s whether or not they have the OK to express what goes for them is the key. This determines whether it’s a positive learning experience or not. We all will learn as we go through our life, that’s mandatory, it just depends on how one chooses to receive them these learnings, by blessings or lessons. I prefer blessings at this point in my life. 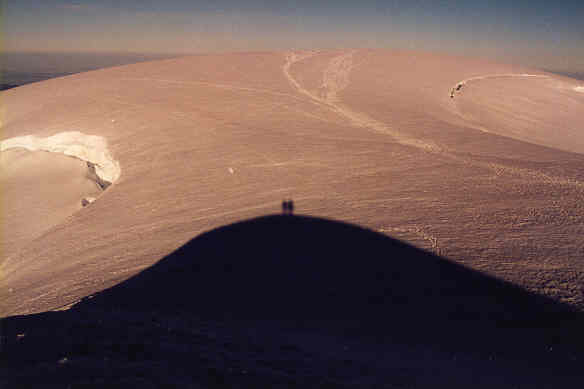 Some individuals, after having prepared for the summits in the high altitudes, still weren’t lucky enough to have made it to the top. They either had a bad summit day, weren’t hadn’t prepared physically, had an unfortunate bout of altitude sickness or some other ailment, or of course, the weather kicked in as it tends to do on high mountains. 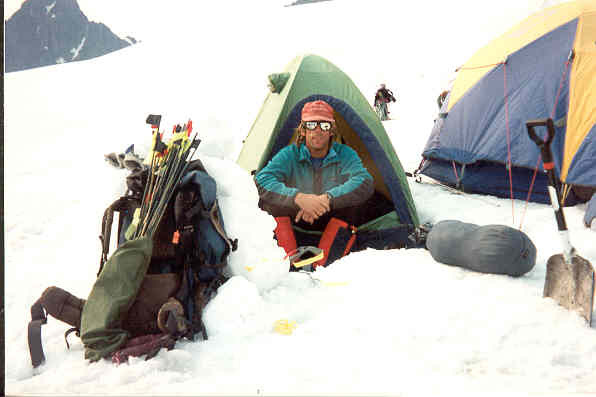 Guiding, at least through some of my expriences working with certain guide companies, wasn’t really set up to allow the full range of emotions that can happen in the mountain environment. Big stuff went down too. Just think back to the events that surrounded the “summit teams” on Everest during “the big disaster”. I recall John Krakaur’s comment in his book about Everest, that stated, “we were a team in name only”. More about this in another post. Guiding is a big fun, but for those wanting a bit more depth to their experience, I’ve got a notion. We can delve into more of who we are, while being out there with others. That’s why I started Mountain Spirit. Learning to respect the mountains through knowledge of safe travel, and learn from an exchange with the mountains, the spirit of the place. Our mission at MSI is facilitating connecting to one’s self, with each other and the environment. We’re well past the time where we can simply be observers of our environment, let alone be adventurers for adventure sake. (See my entry on Willie Unsoeld below). More and more colleges are offering Adventure Education in there Health Department offerings. 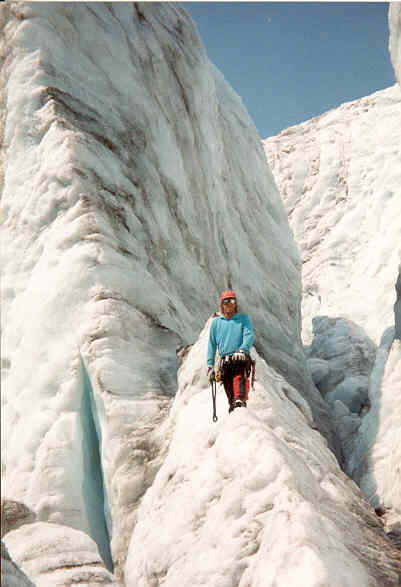 I was an adjunct faculty for an adventure education department for a brief time. The current state of our world demands that we better use our time and energy wisely if we’re heading to the mountains. I’ve given up downhill ski lifts for this reason. It’s bad enough I drive to the mountains, but at least I’d better use my own human power for my day to reach the top of the mountain. Willie Unsoeld had it right when he said that we need to get out there for “our metaphysical fix”, which does indeed make the world a better place. When we come back we can be better contributors to society. I know, I’m a healthier, more well rounded person for my years in the backcountry. So what’s this about “walking our talk”? There are countless guided groups, who are well cared for in the mountains, as are spiritual groups that do shamanic work high in the Andes. Do the latter go there mostly to say they worked with a shaman in the Peruvian Andes? Does their study and knowledge help them to better interact in their immediate day to day lives? Do they chop wood and carry water. I often wonder. I’ll close with an oft quoted saying from Sun Bear, “If it doesn’t grow corn, I don’t want to hear about it.” Climbing mountains is certainly not growing corn in the literal sense, but if you approach it right, (read: right livelihood), than I believe you are indeed making the world a better place. Do the pilgrimage, just don’t use too much gas getting there. This entry was posted on 22/11/2008 at 21:28 and is filed under Climb/Ski/Mntneering, Environment, Inner Work, Leadership. You can follow any responses to this entry through the RSS 2.0 feed. You can leave a response, or trackback from your own site. Can I just ask what is the copyright for the first picture at the top of the page as I want to use it on my own private site if that is ok? The image of me on a glacier at Mt. Baker, and its copyright is owned by me. If it’s for commercial use, there is a nominal one-time “unlimited web use” fee $145.00. If you’re using it for a personal or non-profit use, there is no charge, only a byline/credit “©Mountain Spirit Institute” is required. The fee goes to MSI, a non-profit org. If there’s a watermark, I’d remove for you. Thanks for inquiring, let me know your use and I we can move forward in any way you’d like. Brilliant mountain photograph. Is it alright if I use it with a credit back to your site on an article I’m writing about bicycle climbing and the effects of altitude? Sorry about the delay getting back to you, we’re out an about in…..Ohio, Ykes, en route to Durango. Yes, feel free…just link back with credit to “©Mountain Spirit Institute used with permission”, near the image.